Institute of traumatology and orthopedics of AMN of Ukraine, Kiev. In practice of children's orthopedists of traumatologists rather often to be raised the question of need of confirmation or an exception of disturbances of forming of hip joints (a dysplasia of hip joints, congenital dislocation of a hip) at babies. Clinical symptoms not always give the chance to correctly establish the diagnosis, but they help to allocate risk groups of development of the disturbances of forming of hip joints (DFHJ) . Such risk groups without fail need to be subjected to sonografichesky research. The gold standard for research of degree of a maturity of hip joints - is the technique of the ultrasonic research R.Graf [6,7]. If the question of diagnosis is almost defined, then the question of need of treatment at easy degrees of NFTS remains ambiguous. The delay of ossification of hip joints at rickets is often combined with NFTS and thus complicates not only diagnosis, but also treatment of a dysplasia of hip joints and congenital dislocation of a hip. Sonografiya of hip joints can be also reliable a marker of ossification of its structures, as well as a X-ray. First of all, we have an opportunity to estimate dynamics of ossification of hip joints on terms of emergence of a kernel of ossification . The technique of R.Graf does not consider a condition of a kernel of ossification. However professor of Graf notes terms of emergence of a kernel of ossification normal . According to its data it is 5-7 month of life of the child. Our data are similar to data of the Austrian orthopedist, however when at 5-7 monthly children we did not find ossification kernels in cases we often noted presence of symptoms of rickets. Such tendency forced us to consider a combination of rickets and NFTS more in details. In article the analysis of results of research of 448 babies (171 boys and 277 girls) who addressed on consultation in ITO AMNU in 2005-2006 is provided. All children were sent to laboratory of ultrasonic diagnosis of ITO AMN of Ukraine for the purpose of definition of degree of a maturity of hip joints. The age of the selected group of children made from 5 to 9 months. Average age of 6,4 months. From all group inspected for dynamic supervision we selected 43 babies (23 girls and 20 boys) with NFTS and symptoms of rickets. Average age of group of 6,9 months. Supervision term in dynamics made 1 month. Research was conducted by means of the ultrasonic device Siemens Sonoline G-50 with the linear sensor 7,5mgts. 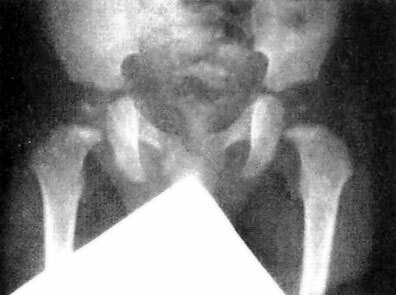 Used a standard technique of R.Graf  with the additional positions of the sensor offered by us for an ossification kernel assessment. The assessment of a kernel of ossification of hip joints was made only for group of dynamic observation. For its location the sensor was located sagitalno and frontally on a lateral surface of hip joints (fig. 1). Measured diameter of a kernel of ossification in various planes and calculated the area for each diameter, then took an area arithmetic average on group. In case of lack of kernels of ossification the area was taken for zero. The same assessment was carried out in 1 month, noted change of average value of the area of kernels of ossification of hip joints on groups. And, it should be noted that exact size discrimination of a kernel of ossification was not our purpose, the assessment of dynamics of its development was a task only. To all children carried out purposeful collecting the anamnesis and orthopedic survey. The selected group of babies estimated daily consumption of calcium and D3 vitamin. At 22 babies who had explicit displays of rickets and daily consumption of calcium and DZ vitamin were low, purposeful vitamin therapy was carried out by Kaltsium-@ drug. Drug was used in the form of syrup, 5 ml of substance contain 625 mg of calcium of a carbonate (250 mg of elementary calcium are equivalent) and 125 ME cholecalciferols. The others 21 babies with moderate displays of rickets which have a consumption of calcium and DZ vitamin approached norm, were carried to group of supervision - control. Figure 1: Sensor positions for an assessment of a kernel of ossification of hip joints. At inspection of hip joints of all group of babies (448) we determined by R.Graf technique normal development of hip joints in 48,2% (216 children), an arrest of development of hip joints at 22,6% (101 babies), 24,3% (109 children) had a dysplasia and the inborn incomplete dislocation and dislocation of a hip defined at 4,9% (22 children). At the same time it should be noted that all children are directed to inspection as risk group, and all babies had clinical signs of NFTS. So the kernel of ossification was absent at children 5 months in 53,3% of cases are more senior (239 babies from 448). It should be noted that in cases when on a sonogramma of a kernel of ossification were absent at children 5 months are more senior, in 35,3% of cases we noted clinical signs of rickets. At children 6 months such manifestations already at 37,2% of children were more senior. And at group 7 months in the absence of kernels of ossification of display of rickets are more senior were defined at 52,6% of children. With NFTS clinical displays of rickets were present at group of babies in 36,9% of cases, these data are similar to data in general on group of children 6 months are more senior. 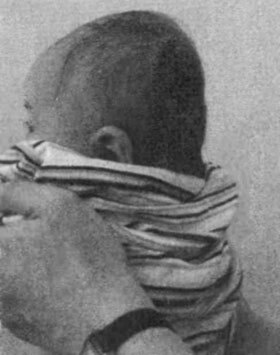 At newborns most often occurred among clinical displays of rickets: vegetative changes (the increased perspiration, increase of vasculomotor excitability, a bad dream, excessive fearfulness) of 85,4% of cases, baldness on a nape of 66,6% of cases (fig. 2a), deformation of bones of a skull (craniotabes) of 48% of cases (fig. 26). Insufficient consumption of microelements and vitamins by women during pregnancy and feeding leads to a hypovitaminosis at newborns and as a result to rachitic changes. The research conducted in 1994 in St. Petersburg and devoted to studying of a diet of pregnant women showed that only in relation to 6 of 100 inspected it was possible to talk about sufficiency of the main nutrients and power providing. Besides, at all pregnant women multicomponent insufficiency of food came to light. Most often they noted deficit of iron, iodine, calcium, zinc, chrome, folic acid, biotin, A, D, V1, V6  vitamins. 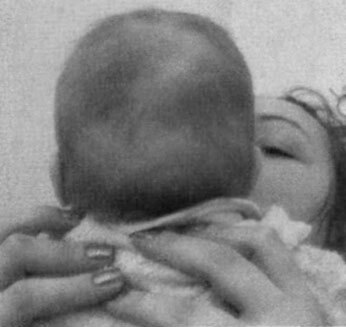 Figure 2a: Baldness on a nape of the baby at rickets. Figure 2b: Deformation of bones of a skull (craniotabes) at rickets. Calcium provides a number of the vital functions of an organism: structural (the main component of a bone tissue and a dentine), neuromuscular (controls and provides excitability, release of neuromediators, reduction and relaxation of muscles, including sokratitelny ability of a myocardium), fermental (a cofactor of components of coagulant system of blood). Calcium is necessary to the growing fruit in excess quantity both for growth of bones and teeth, and for forming of a nervous system, heart and muscles. Deficit of calcium can lead to a growth inhibition of the child. For successful prevention and treatment of gipovitaminoz and vitaminodefitsitny states there are two ways: dietary correction and purpose of vitamin drugs. Breast milk of the healthy woman contains a full range of necessary vitamins (except for vitamin D which content is extremely insignificant). Nevertheless, the structure of breast milk in many respects is defined by features of a food allowance of the feeding woman, and also depends on a season. At the same time long feeding by breast milk against late introduction of a feeding up (7-8 months and later) does not allow to avoid at the child development of a hypovitaminosis even at observance by nursing mothers of the full-fledged balanced diet. And though, according to a number of the American pediatricians, at observance of a full-fledged diet children do not need additional purpose of vitamins, by many European specialists is counted that even at the most balanced and various food allowance deficit on the majority of vitamins for 20-30% is noted [4,8]. Thus, the diet possesses the important, but not defining role in prevention and treatment of a vitamin deficiency. At the same time at purpose of vitamin complexes children need to remember that long reception of vitamins B large numbers is accompanied by risk of implementation of their toxic impact on an organism (hypervitaminoses). In 36,5% of cases in the presence of symptoms of rickets we noted presence at the child of an intestinal dysbiosis. It became a find in our work as displays of dysbacteriosis were explicit. At such babies the chair happens not just liquid, and foamy, appetite worsens, weight slowly increases, gas generation and motility of intestines amplify. Then appear: frequent vomiting, a foamy chair with greens and slime, the kid ceases to put on weight, on his face, hands and legs there are allergic rashes. In the analysis a calla on dysbacteriosis aerobes prevail over anaerobe bacterias. At heavy dysbacteriosis to make the diagnosis, it is not necessary even to do the bacteriological analysis, it is enough to look at a dirty diaper (pampers) - a chair very liquid, with a green shade and a pungent unpleasant smell. Bifido is not - and lactobacilli in him at all, but opportunistic microorganisms contain much. At this stage of dysbacteriosis there are system disturbances conducting to rickets, anemia, a hypovitaminosis, dermatitis. Intestines microbiocenosis - very important system of an organism which is carrying out or regulating its numerous functions on maintenance of a homeostasis. One of the most important functions of normal microflora is ensuring physiological, biochemical processes in a digestive tract on digestion and absorption of food. Thus, it is rather important in the presence of symptoms of rickets at babies to estimate an intestines microbiocenosis condition. At a combination of dysbacteriosis and rickets treatment has to be complex, directed to normalization of a microbic homeostasis of intestines, carrying out vitamin therapy. We treated such children together with pediatricians or gastroenterologists. In our researches rather effective for prevention and treatment of rachitic manifestations was Kaltsium-@ drug. Drug was used in a dosage of 5 ml a day in case of prevention and in case of treatment of rickets at babies 5 months are more senior than 10 ml. After a course of treatment during 1 - go month we received reliable signs of increase in the size of a kernel of ossification in comparison with control group (r <0,05) (fig. For; 4a, c). In group of the hip joints receiving treatment a gain of the area of a kernel of ossification made 14,0 ± 1,78 mm2, in control - 5,67 ± 0,94 mm2, reliability of distinctions r <0,002. Also expressiveness of clinical displays of rickets (fig. 5) decreased. Allergic reactions to drug were not noted. Drawing For: Sonogramm of hip joints of the boy of 5 months with symptoms of rickets before treatment (there are no kernels of ossification). 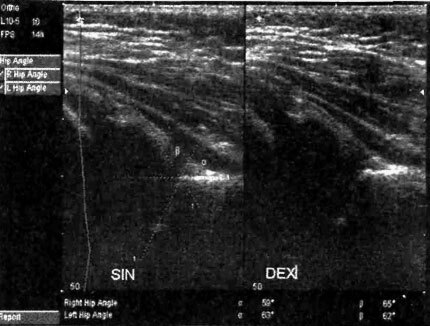 Figure 3b: Sonogramma of the same child in 6 months, after a course of treatment Kaltsium-@ drug. Lack of a kernel of ossification on the roentgenogram or a sonogramma is rather frequent 5 months are aged more senior, at normally developed pelvic component and a normal ratio in hip joints, it is treated by orthopedists as manifestation of NFTS. Despite strong indications of rickets at such children it appoints unreasonable treatment in the taking-away devices (Pavlik's stirrups which are taking away devices). 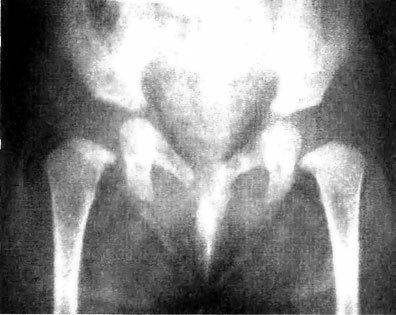 In similar cases, at clinical symptoms of rickets, normally developed pelvic component and a ratio we find in hip joints when there is an explicit delay of its ossification on the roentgenogram or a sonogramma more correct to doobsledovat the baby and to carry out antirachitic treatment together with the pediatrician, without using the taking-away devices (rice 4a, c). vegetative disturbances, 2 baldness on a nape, 3 craniotabes. At orthopedic treatment of NFTS it is very important to consider existence of symptoms of rickets and dysbacteriosis at children and to carry out, if necessary, drug treatment. Figure 4a: The roentgenogram of hip joints of the child of 3 months with symptoms of rickets before treatment (there are no kernels of ossification). Figure 4b: The roentgenogram of the same child with symptoms of rickets in 5 months, treatment was not carried out (there are no kernels of ossification). Figure 4v: The roentgenogram of the same child in 8 months, after a course of treatment Kaltsium-@ drug. 1. With disturbances of forming of hip joints clinical displays of rickets were present at group of babies in 36,9% of cases. 2. At absence on an ossification kernel sonogramma at children 5 months are more senior, in 35,3% of cases we noted clinical signs of rickets. 3. In 36,5% of cases in the presence of symptoms of rickets we noted presence at the child of an intestinal dysbiosis. 4. Orthopedic treatment of disturbances of forming of hip joints at children should be supplemented with drug treatment of rickets and dysbacteriosis in the presence of their signs. 5. At a normal ratio in hip joints and sufficient development of a joint hollow lack of kernels of ossification of hip joints at babies is more senior than 5 months in the presence of the expressed symptoms of rickets or dysbacteriosis is not the indication for use of the taking-away devices. 6. In the absence of kernels of ossification of hip joints and existence of symptoms of rickets or dysbacteriosis at babies 5 months are more senior purpose of drugs of calcium and D3 vitamin is recommended. 7. In our research rather effective was a drug use Kaltsium-D in a dosage of 5 ml a day in case of prevention and in case of treatment of rickets at babies 5 months are more senior than 10 ml. Institute of Traumatology and orthopedics of AMS of Ukraine, Kyiv. The article contains comparative results of an ultrasonography of the infant hip by prof. Graf method 448 newborns with manifestation of a rickets. 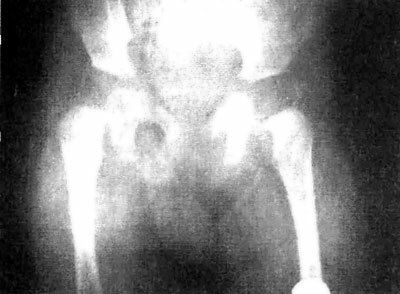 The clinical manifestation of rickets were present at group babies with dislocation of the hip in of 36,9% of cases. In absence on a sonogram a nucleus of ossification of hip at children are more than 5 months, in of 35,3% of cases we marked clinical attributes of a rickets. 1. Vovchenko A.Ya., Kutsenok Ya.B., Zinchenko V. V., etc. Ultrasonic research of a hip joint at children of the first years of life as a marker of forming of a skeleton//osteology Problems. - 2003. - T.6.-№4. - Page 64. 2. Korovina N. A., Podzolkova N. M., Zakharova I.N., etc. Influence of vitamins and microelements on a state of health of the pregnant woman and fruit.//Attending physician. - 2004. No. 12. - Page 11-13. 3. Kutsenok Ya.B., Roel E.A., Melnik V. V. An inborn dysplasia of a hip joint, an inborn incomplete dislocation and dislocation of a hip//To. : Zdorov'ya. - 1992. - 182 pages. 4. Tutelyan V.A. Vitamins: 99 questions and answers. - M.: Book, 2000. - 106 pages. 5. 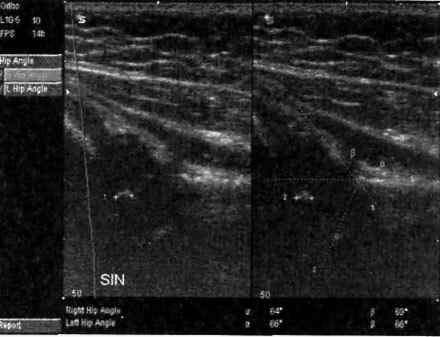 Ultrasonografiya in diagnosis and treatment of a dysplasia of a hip joint at children. Guide to a sonografiya of a hip joint/Ruble. Graf, P. Farkas, K. Lerkher, etc. - Vilnius, med. diagnost. centras, 2001.-42 with. 6. Dahlstrom H., Oberg L, Friberg S. Sonografy in congenital dislocation of the hip//Acta Orthop.Scand. - Vol. 57, 5-P. 402-406. 7. Toennis D., Storch K., Ulbrich H. Results of newborn screening for CDH with and without sonography and correlation of risk factors//J Paediatr.Ortop.-1990. - P.145-152. Rickets and rakhitopodobny states at children"